New Orleans fans knew that Boogie Cousins would not turn them into an overnight contender. They knew he and Anthony Davis would make a dynamic and very entertaining duo. Three games into the Boogie-Unibrow Era they have provided fans with plenty of entertainment—but no wins. They lost by 30 to the Houston Rockets in their first game back from the All-Star break and lost the second to the lowly Dallas Mavericks by 13-points. 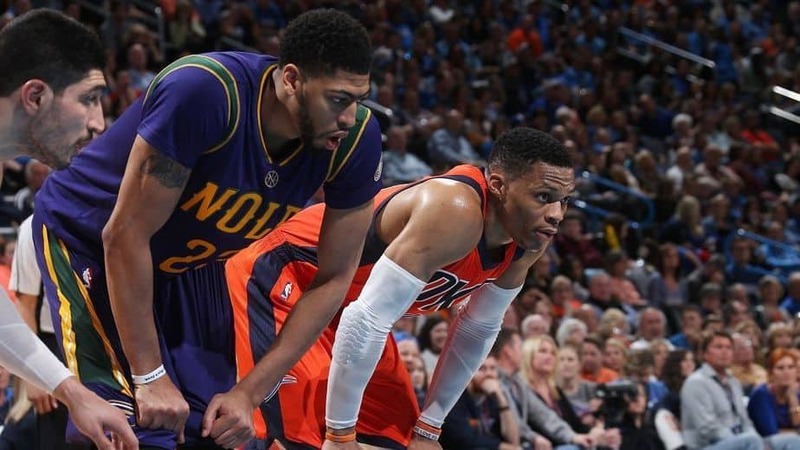 Fans hoped for the best when their team took on the Oklahoma City Thunder Sunday, and–well, they did get a good game out of Anthony Davis and Boogie Cousins. But Russell Westbrook’s game was better. The triple-double machine recorded his 29th triple-double of the season (41 points, 11 rebounds, 11 assists) to lead the Thunder to a 118-110 win over the Pelicans. Westbrook’s night started off a little slow. At halftime, he only had 10 points and nine assists to his name. The second half didn’t get off to a good start, and by time the third quarter ended he had connected on just seven of 19 shots—but then he caught fire in the final quarter scoring a career high 21-points in the final quarter (shot seven of ten from the field). He had his 29th triple-double of the season locked up with four minutes to spare. Cousins and Davis turned in good games for the Pelicans; just not good enough. Davis got the game off to a good start for the Pelicans with 24-points in the first quarter to help the team take a 35-32 lead after the first. He would end the game with 38 points and seven rebounds. Davis didn’t get much help from Cousins because of early foul trouble. Cousins was hit with a technical foul 32 seconds into the game after getting tangled up with Steve Adams. It’s his 18th tech of the season which means he will be facing another one-game suspension. If that wasn’t bad enough, he also recorded two personal fouls within the first 95 seconds and eventually ended up fouling out of the game. Despite only playing 21 minutes during the game, he scored 31 points and ten rebounds. Fans got a good look at what the future could entail with Cousins, the good and the bad. His volatility can get him—and the team—in trouble, but when he’s on the court, he is a force to be reckoned with. Westbrook is now on pace to record 40 triple-doubles this season, one shy of Oscar Robertson’s record of 41 from the 1961-62 season. He now has seven with 40+ points tying him for second on the career list with wilt Chamberlain (Robertson had 22). 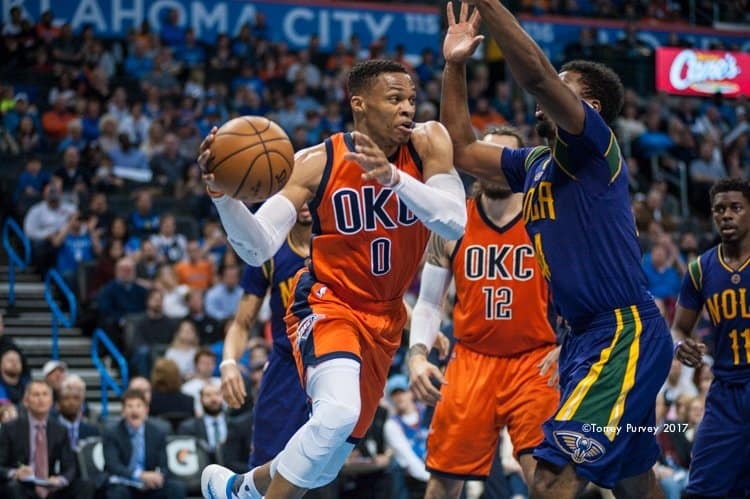 Oklahoma City will try to make it four in a row when they take on the Utah Jazz at home Monday night. New Orleans will try to record its first win with Boogie Cousins Tuesday night when the Detroit Pistons come to town.